thanks for this comment! i agree the sooty tab is a bit hard to find so i'll try to change that in an update. There are female characters in the game that are in a relationship, and this relationship is the reason for the game. this was absolutely lovely! i hope to see more of alba and ilaria soon. this is a known issue for the engine (ren'py) and norton. it's a false positive, so no worries. the new build works, thank you! i really like the art style of the game - it's very soft and soothing. hello, i wanted to play this on my windows pc, but the following error message pops when i try to launch fire chats.exe: "Fire Chats.exe - System Error / The code execution cannot proceed because UnityPlayer.dll was not found. Reinstalling the program may fix this problem." i think this might be able to be fixed if you play games without sandbox mode, but i wouldn't recommend that unless you are sure that a game is safe to use. thank you for playing & i'm glad you enjoyed it! is there something that can be done game-wise regarding that bug? if there is a save issue, i'd love to try my best to fix it. 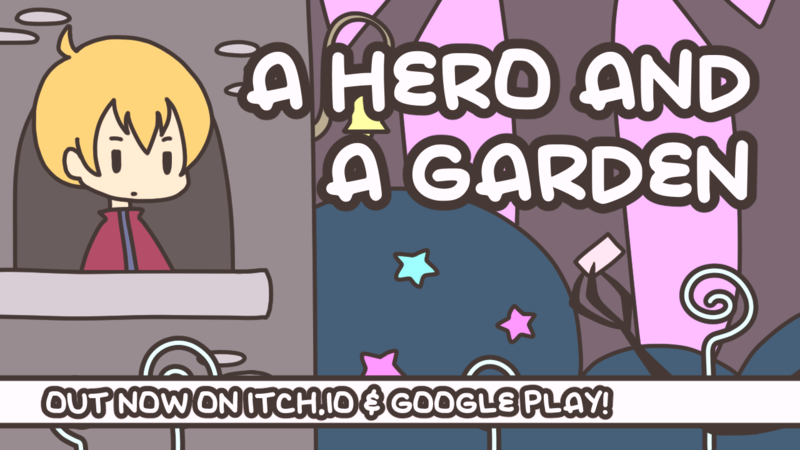 A HERO AND A GARDEN is a visual novel & clicker game released today for nanoreno2019, a month-long visual novel game jam. play as an intrepid hero who tries to save a princess but fails terribly, so he ends up stuck tending a garden instead. gameplay is 1~2 hours with one ending+character variants. i liked the exploration mechanic in this game! it really feels like going around an abandoned town. try pressing more info and running the game from there. sorry about the controls! rpg maker on android doesn't seem to have a good way to recognise "looking in this direction and tapping" right now. thank you for the lovely comment, and yes you can definitely translate the game to french if you like! i've sent the files to your email. all the language and themes should be appropriate for children, so please go ahead! i'm sorry that some parts made you feel uncomfortable but i'm glad you liked the game! the game is made in ren'py, an open source visual novel engine! thanks for playing! for the bad ending, if you use the hint system in-game, try to make sure the hearts go down with every choice. itch.io Community » itch.io » Questions, Ideas & Feedback · Replied to leafo in Spam on one specific game / Spam filter? Thank you very much. For now I have taken the advice from another reply and closed comments temporarily. itch.io Community » itch.io » Questions, Ideas & Feedback · Replied to No Time To Play in Spam on one specific game / Spam filter? itch.io Community » itch.io » Questions, Ideas & Feedback · Created a new topic Spam on one specific game / Spam filter? Recently I have been receiving spam fairly frequently on one of my games. It's always in the same format (something about how it was a good forum/blog post and then a link to some spam website) and the same user posts multiple times. I have reported these spam comments anad then banned these spam users multiple times, but it seems to keep getting through. This only seems to occur on the one game, so I considered just locking the comment section, but I would still like to leave it open in case anybody that isn't a spam bot wants to leave feedback. Is there any way to implement a spam filter of some sort to avoid this?